On Saturday, December 2, 2017 Post 177 held it's annual Christmas Breakfast meeting at Davidson's Restaurant in Cornersburg. Once again, through the kindness of Frank Davidson, owner of Davidson's Restaurant, the meal was provided free of charge to the thirty-eight (38) members, family and guests in attendance. A big "THANK YOU" to Frank Davidson!!! Commander Mike Kubitza and Milton Kochert at the Lord of Life Lutheran Church Veterans Program in Canfield on November 13, 2017. Below are some of the veterans currently residing at local care facilities who were presented with a small American flag and a "Thank You Veterans" card hand made by Fourth Grade students from Hilltop Elementary School. 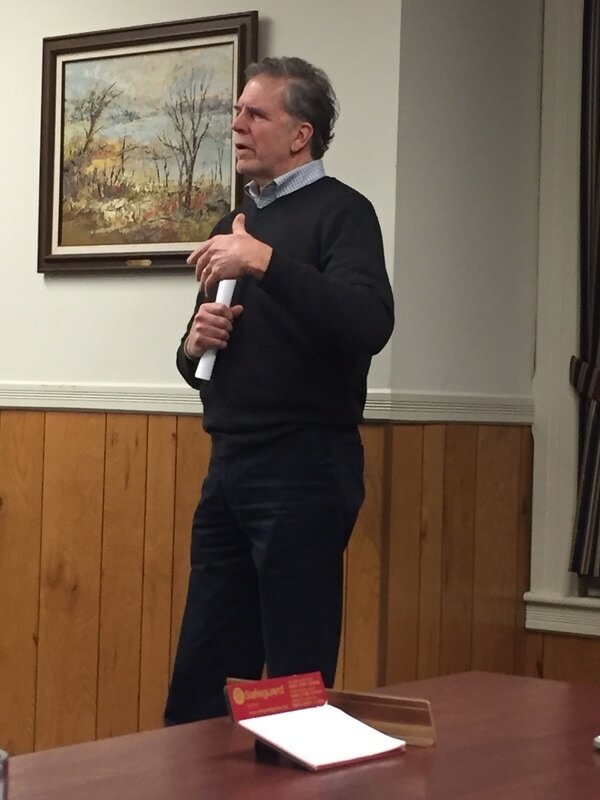 Post 177 member Jim Duffett was the guest speaker at C.H. Campbell Elementary School's Veterans Day Assembly on Friday, November 10th, 2017. Channel 27 WKBN interviewed Jim prior to his speech. 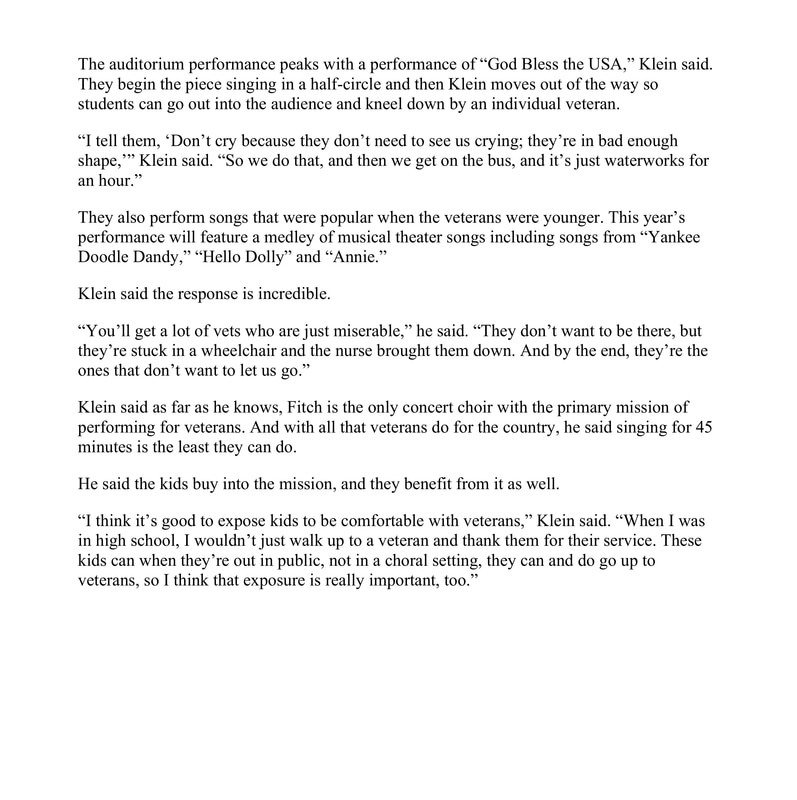 That interview can be seen below (click on arrow to play). A few photos from the Mahoning County Retired Teachers Association annual Veterans Day Luncheon 2017. Photos from the flag burning ceremony at the Canfield East Cemetery on November 7, 2017. The American Legion District 9 has published a District Resource Directory. This valuable document includes contact information for all district officers and Posts. You can access the Directory by clicking HERE. Mahoning County Legion Commander Terry Johnson swears in the 2017-2018 officers of Post 177. Photo montage from the 2017 Fourth of July Parade in Canfield. Below are some photos from the 2017 Memorial Day Services on The Green, in the East Cemetery and at the Wall of Honor at The War vets Museum. First Vice Chuck Coleman presents Certificates of Appreciation and Legion Challenge Coins to members of the Youngstown Air Force Reserve Station Composite Squadron 051 Color Guard for their support of the Memorial Day 2017 Memorial Day Services in Canfield. 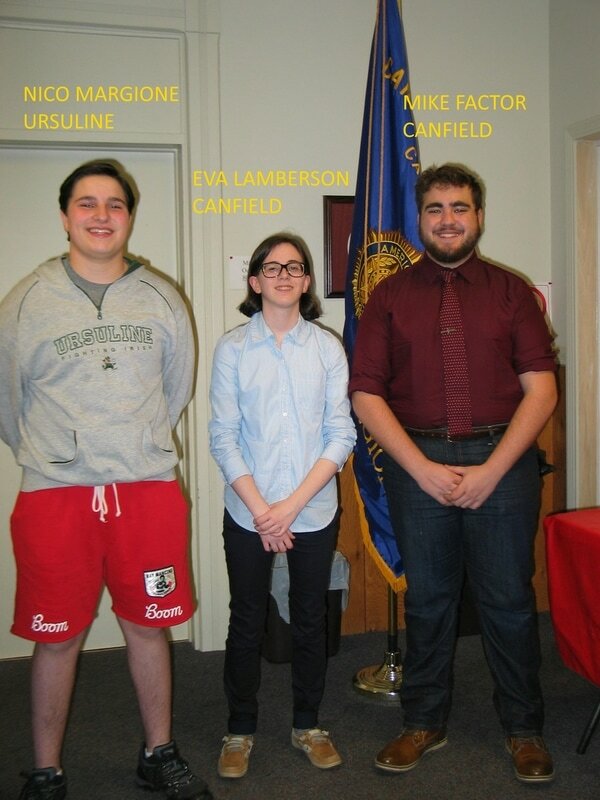 At our April meeting, members of the Austintown Fitch High School Concert Choir gave short presentations to the assembled Post. 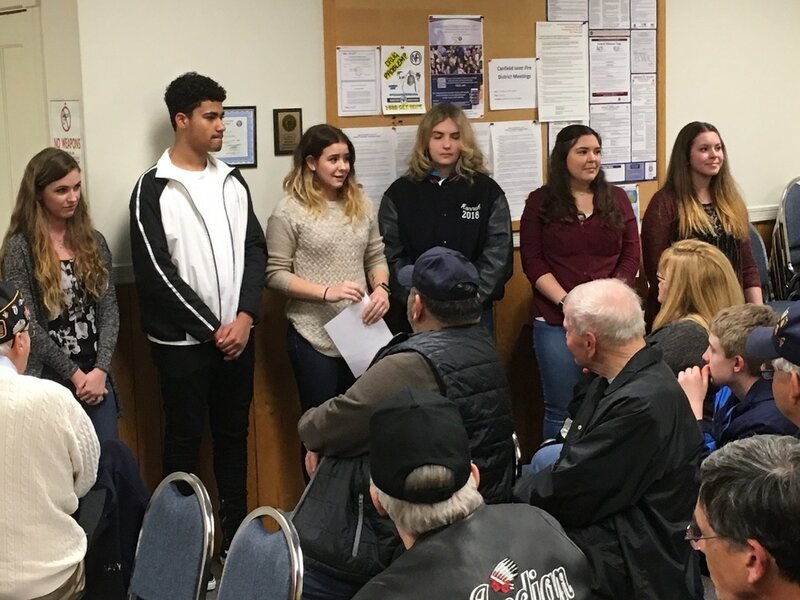 Each of the choir members (above from left: Taylor Phillips, Brice Bucci, Kylie Anthony, Hannah Rosser, Becca Kielbasa and Maddie Glavic) described the impact that their annual performances at Veterans Hospitals has had on them. The choir is under the direction of Bill Klein (not pictured). 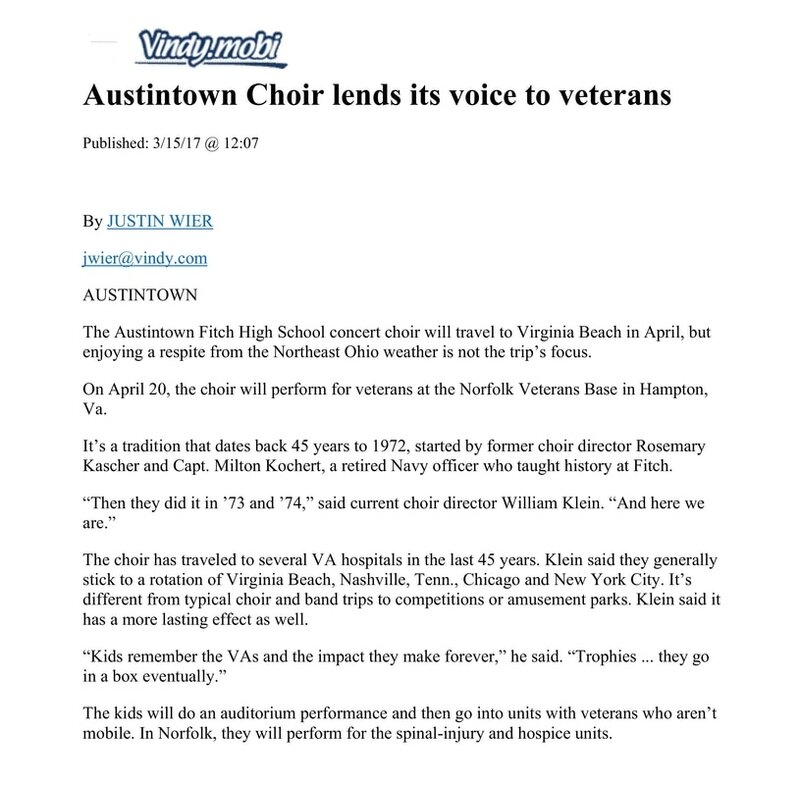 Below is a recent Vindicator article about the Austintown High School Choir in which Post 177 member Milt Kochert is credited with helping to found the organization. 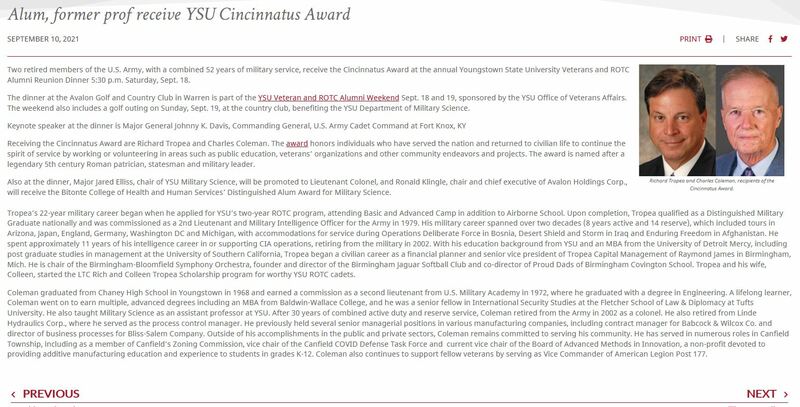 At our March meeting, Dr. Robert Marcus, Homeless Veterans Outreach Coordinator at the Youngstown VA Clinic, provided a detailed presentation to Post members on the plight of homeless veterans in The Valley and nationwide. He also offered descriptions of the various assistance programs available to homeless veterans.